Signet Maritime Corp. and Garrett Marine, Inc. executed agreements August 29. 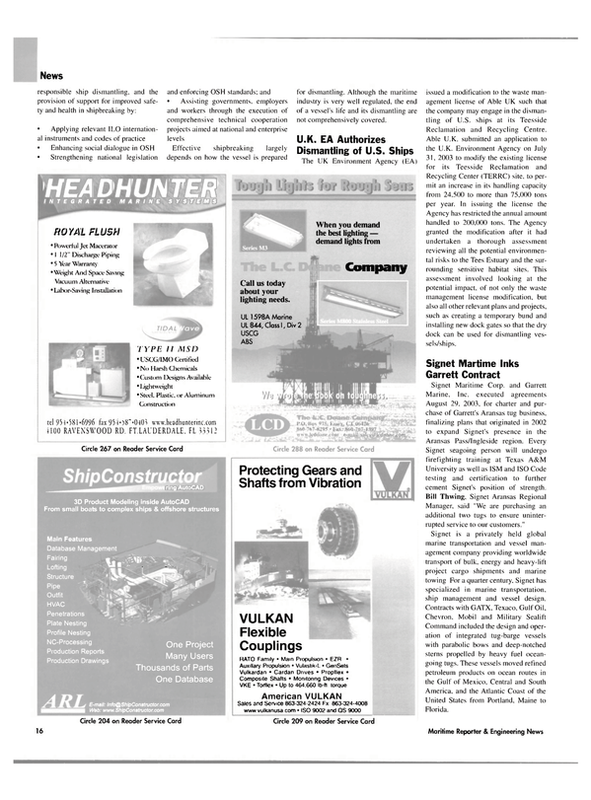 2003, for charter and purchase of Garrett's Aransas tug business, finalizing plans that originated in 2002 to expand Signet's presence in the Aransas Pass/Ingleside region. Every Signet seagoing person will undergo firefighting training at Texas A&M University as well as ISM and ISO Code testing and certification to further cement Signet's position of strength. Bill Thwing, Signet Aransas Regional Manager, said "We are purchasing an additional two tugs to ensure uninterrupted service to our customers." Signet is a privately held global marine transportation and vessel management company providing worldwide transport of bulk, energy and heavy-lift project cargo shipments and marine towing For a quarter century. Signet has specialized in marine transportation, ship management and vessel design. Contracts with GATX, Texaco, Gulf Oil, Chevron, Mobil and Military Sealift Command included the design and operation of integrated tug-barge vessels with parabolic bows and deep-notched sterns propelled by heavy fuel oceangoing tugs. These vessels moved refined petroleum products on ocean routes in the Gulf of Mexico, Central and South America, and the Atlantic Coast of the United States from Portland. Maine to Florida.